You have access to Export your expense information to a PDF report from multiple areas in your account. Once logged in please follow the below steps to generate a PDF Report of your expenses from Draft, Awaiting Approval or Approved. You will also have the option to download the related receipt images. 1. Navigate to your Expenses menu and select Draft, Awaiting Approval or Approved. 2. Click the blue Filter to expand to show the search criteria options. Enter the range and apply further Search criteria. 3. Click the Update button. Your expenses will be presented in a summary form. 5. Click the Export button and then Selected. Enter a name for your Report in the Report Name box. Select the Detailed PDF Report Format. Click to tick Include receipts if you wish to download a copy of the related receipts. You will find your PDF Report is in your default download folder on your PC. If you included receipts these will be found in a newly created folder. 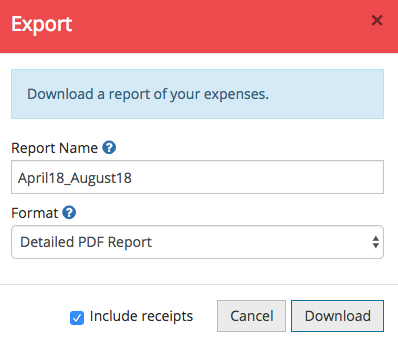 Hyperlinks in the PDF Report will allow you to access the related expense receipt easily so, please ensure the PDF file and the receipt folder are saved in the same place. Your company Finance Team also have access to report on your expense history information.